Order your snowmobile map and begin planning your 2018-2019 getaways today! It's time to order you 2018-19 snowmobile trail pass. You must have your AWSC membership number and your Wisconsin DNR snowmobile registration number to purchase a $10 trail pass. You must be a current member of a club to get the discounted $10 trail pass. Join a club today - Price County Snowmobile Clubs. Your AWSC number does not change from year to year. Trail passes can be ordered online through the AWSC website (fast and easy). Or, send a check with the form that you can print off the AWSC website. Or find the form in the Wisconsin Snowmobile News Magazine. If you wait until the week between Christmas and New Year's don't expect your trail pass to arrive quickly! 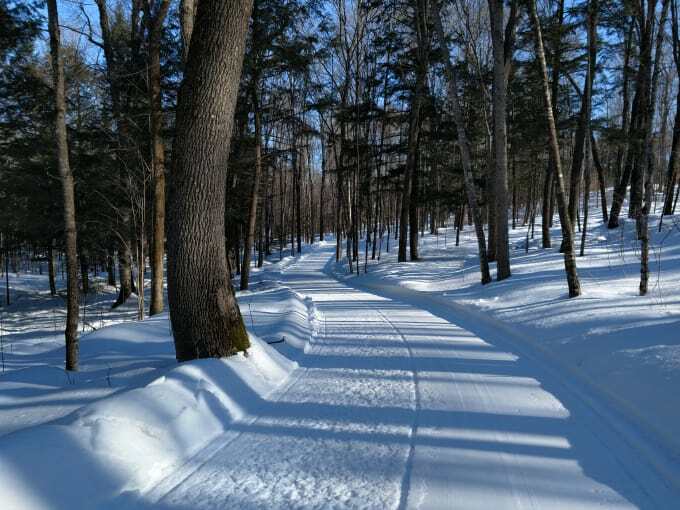 Wintergreen Trail - (skate & classic xc-ski, snowshoe, & fat tire bike) – 12/6/18 - We have about 3" of snow at Wintergreen, not quite enough to start packing but close. I may start packing next week and checking wetlands to see how well they are freezing up. Extended forecast isn't looking too promising, but that can change in a minute. Palmquist Farm (skate & classic xc-ski, snowshoe, & skijor) - 12/4/18 - We have about 2-3 inches of snow on the ground right now but nothing groomed until Christmas. Order your silent sports trail map and begin planning your 2018-2019 getaways today! Snowshoeing, fat biking and skijoring is allowed on some trail systems during cross-country ski season. However, trail managers ask that these trail users stay off of the classic tracked portions of trail. Flambeau Trail System (70 miles) ~ OPEN May 1 through March 15 - Report date 12/6/18 - OHV trails are open until spring break up, and everything should be pretty firm from the cold temps. There is very little snow on the ground. Trail dozing work is wrapped up due to frozen ground conditions. 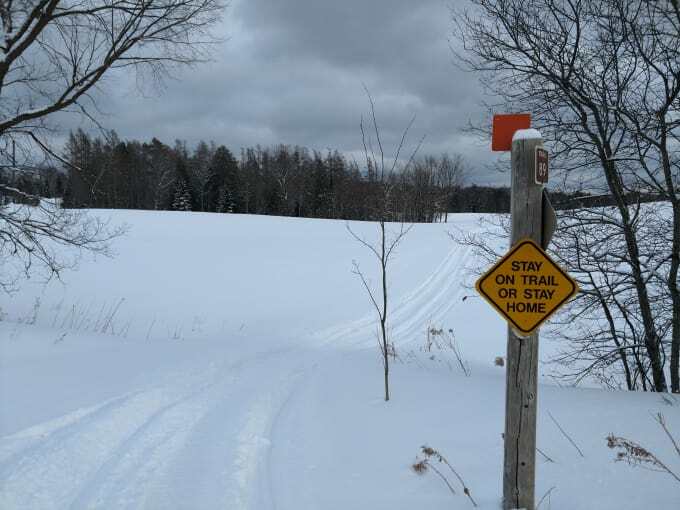 Pine Line / Price-Taylor Rail Trail/Prentice Area ~ CLOSED - The Price County section of the trail allows ATV and UTV use December through March 31 when snowmobile trails are officially open. Click here to find Taylor County contact information for inquiries regarding their open and close dates or call 715-748-1486. Solberg Trail (9.5 miles) ~ CLOSED FOR REPAIR - Open May 1 through March 14 - The Solberg trail is completely closed due to bridge repair. The repairs should be completed for the May 1, 2019 spring opening. Trail manager - Price County Forestry & Parks Department - 715-339-6371.
https://dnr.wi.gov/topic/parks/name/tuscobia/. Trail manager - Natural Resources Property Supervisor - 715-669-4342. Flambeau River State Forest Trail (38 miles) ~ CLOSED FOR THE SEASON - Open May 15 through November 15. Trail manager - Flambeau River State Forest - 715-332-5271. MADISON - With more crashes involving all-terrain and utility-terrain vehicles this late summer state conservation wardens are urging all operators and riders to remember safety steps. Wisconsin has seen 16 fatal crashes involving all-terrain and utility-terrain vehicles this year. Ice is forming on lakes across the state but state recreational safety wardens are reminding people that no ice is safe and that early season ice conditions vary greatly from waterbody to waterbody. There seems to be a good strong population of bobcat this year in the Flambeau River State Forest. Their prey: snowshoe hares, cottontail rabbits and rodents are also well populated. Bird feeder watchers are reporting many of the standard species now, like woodpeckers, nuthatches, chickadees, and goldfinches, in addition to a few specialties such as pine siskins statewide, evening grosbeaks up north, and the occasional common redpoll. Spring is a long way off, but don’t forget the spring turkey and 2019 bear application is due by December 10. December is the Little Spirit Moon with lakes freezing over and snow starting to accumulate. There is a light layer of ice on the lakes with light snow cover around us here at the Flambeau River State Forest. Tracks from rabbits, squirrels, weasels, deer and elk are just a few of the animals roaming the forest and it is amazing what you see and hear when you just watch and listen. The deer and elk are feeding heavily to fatten up in preparation for the deep winter months. Many are feeding in the active timber cuts on the forest. There are cow/calf groups with some of the young bulls. The big bulls are forming bachelor groups. The grouse season is open until December 31, and some various deer hunting opportunities are still available, check your 2018 Deer Hunting Regulations. There are 7 active logging sales at this time on the Flambeau River State Forest. Be aware of large logging trucks on the roads. Come and enjoy this beautiful river and the wilderness of the Forest. If you have a plan to hunt or hike, we suggest you bring a compass, as some navigational devices will not have reception. MADISON - Black bear and wild turkey hunters are reminded to submit their applications before midnight on Dec. 10. The river will begin to open, become ice free, in April 2019. See you next spring! Robinson Landing, located on the North Fork of the Flambeau River just below the Turtle Dam, is closed for the 2018 season. The road is closed to the general public. Xcel Energy’s Dike 10 construction project will end at the end of November 2018, with additional road work scheduled for Spring 2019. For more information regarding the closures contact DNR employee Brett Bockhop at 715-476-7846 or Brett.Bockhop@wisconsin.gov. For your safety always wear a personal flotation device (PFD). Check with an area rental/shuttle service for the most current conditions and to select a suitable stretch of river based on your experience. Resource manager - Flambeau River State Forest - 715-332-5271 or Park Falls DNR - 715-762-3204. The North Fork of the Flambeau River is controlled by dams and it generally remains near the ordinary high water mark throughout the summer. The South Fork of the Flambeau and other rivers in the area can become quite low at times during the summer months without consistent rain. When planning a paddling trip, check with an area rental/shuttle service for the most current conditions and to select a suitable stretch of river based on your experience. Price County's leaf color is past peak. Historically, peak color occurs during the first week of October.